Well, the book is more or less finished and we're back from our holiday in South Africa (not a fishing holiday but what a place!). I'll put a few pictures on the site as soon as I get them sorted - elephants, buffalos, lions, leopards, hippos, giraffes, eagles, storks, cranes, crocs, penguins, sea lions, whales and the most fantastic array of plants I've ever seen in my life. We'd hardly put our feet on the ground, back in Dorset, when Ben rang me to ask whether I fancied a spot of fishing - he'd had one or two decent bass in my absence so it was very tempting. As it happened I've ricked my thigh while I was away so the option of climbing up and down cliffs didn't appeal to me much. We decided to have a gentle walk along the seafront at Swanage in deference to my crippled condition. The morning was mild, dank and foggy when Ben rolled up to collect me - not too bad for starters. It was MUCH darker than I'd anticipated for 05.15 - what a change in three weeks! I noticed that we'd both armed our rods with identical surface lures, obviously great minds thinking alike or something. It was high water springs, the sea was flat and there was no tide running, although periodically a big swell would roll in and threaten to sweep us into the deeper water. At first it was too dark to fish areas where there might be gill nets or boat moorings (both constant hazards in Swanage Bay). I could only stand on the flat rocks or concrete walkway because of my injury but with plenty of water depth to play with and little wind there was no problem fishing a popper. After ten minutes I had what felt like a slight touch and I mentioned it to Ben. We flogged on with renewed enthusiasm and eventually, despite the foggy morning, light began to show in the eastern sky. We switched places a couple of times just for a change and eventually I had a good bite and hooked a decent fish. As Ben approached, to see what was going on, disaster struck and the fish came unstuck - what a downer! 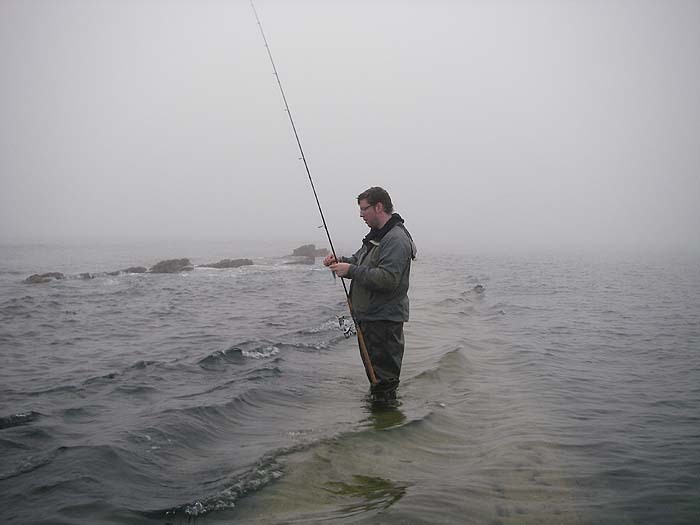 After another fifteen minutes and another switch of positions suddenly my rod bowed and the reel began to buzz. 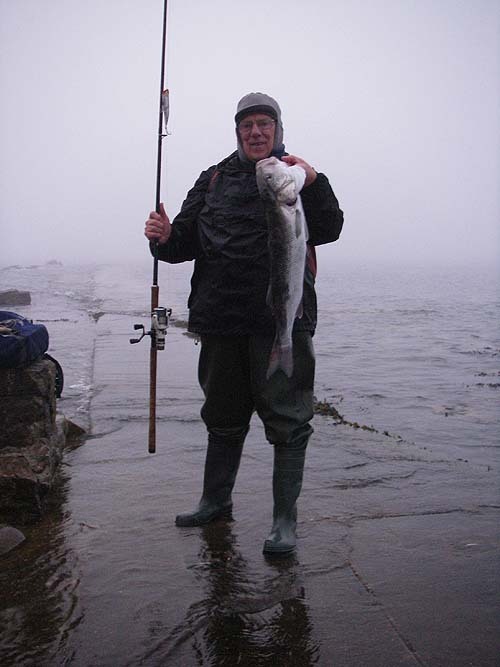 Clearly it was a nice bass but it was on the far side of a big rocky ledge - tricky business!. 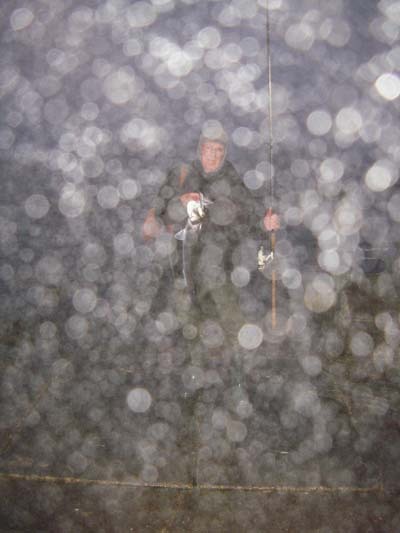 I allowed the fish to fight itself almost to a standstill before, with rod held high, sliding it over the ledge and into the nearside gully. After beaching the bass Ben weighed it - seven pounds - a beauty. My pal extracted my camera from the bag and took a picture. As I've mentioned it was a pretty dull morning so he used the flash and looking at the results commented that there was something wrong. In fact it looked as though I was standing behind a pane of frosted glass. Ben cleaned and polished the lens but the results were no better. Bugger! I thought, the camera's had it. I put the fish down, took hold of it and switched off the flash. This time, when I pressed the button - no problem! After a bit of thought it became clear that the flash was simply reflecting off the (invisible) mist droplets in the air, something neither of us had seen before - phew!!!!! So all's well that ends well.